Odhrán McDonnell discusses the relative renaissance which Irish chess has enjoyed in recent years, and why the game has a bright future ahead. Share the post "Chess: the rise of a different kind of sport"
Chess may not be regarded as a sport in a conventional sense, but irrespective of this, it has seen a major increase in popularity in Ireland in the last decade. While the chess community is still relatively small and unknown on these shores, its continued expansion suggests that this may not be the case for much longer. In 2018, The Irish Chess Union (ICU), the body responsible for governing and running Irish chess events, announced a 50% increase in membership since 2015, a remarkable rate of growth for any organisation. They also found that there were 1100 active youth players in the country, including 220 new players in 2018 alone. 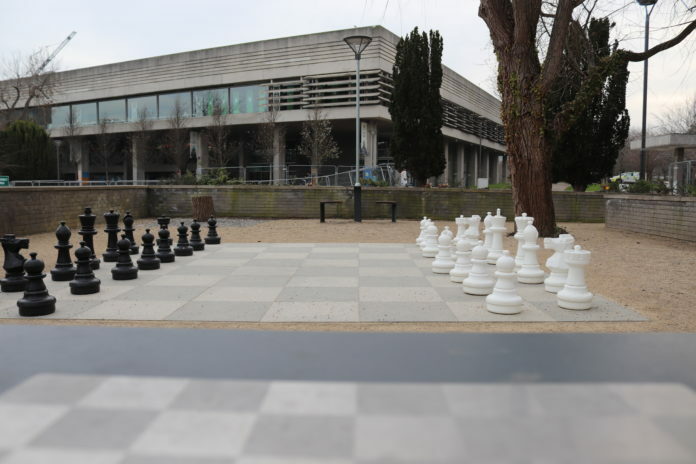 This trend has also been evident here in UCD, with the revival of the UCD Chess Society since 2016. In the modern, digital world, in which video games and smartphones are dominating our lives, it seems that chess is offering an increasing number of people with a welcome escape from technology. The origins of the recent renaissance must be traced back to 1993, when Grandmaster Alexander Baburin arrived to live and play chess in Ireland for a year. An elite Russian-born player who had once been one of the top 100 chess players in the world, Baburin decided to settle in Ireland on a permanent basis. In the years that followed, he set about raising the profile of Irish chess in many ways, such as selling chess books, giving seminars and teaching in primary schools. In the 1990s, chess was not a popular hobby for children, with it not being uncommon for chess clubs to meet in pubs. However, Baburin’s work helped to inspire ambitious young players to develop their hobby into something they could take more seriously. He now teaches in over 20 schools, with up to 700 children receiving weekly lessons from Baburin himself and highly rated players from universities such as UCD and Trinity College. He also organises monthly tournaments so that his students can test themselves against players from other schools. This model has produced many of the best young Irish players of recent years, highlighted by the rise of former Baburin student Conor O’Donnell to FIDE Master (FM) status amongst others. It is inevitable that current students will be inspired by the resounding success of their predecessors, and this can only further bolster the strength of Irish chess in years to come. The vital work of Baburin has been complimented by the development of some strong youth sections of chess clubs. At primary school age, the leaders in this regard are the clubs based in Rathmines and St. Benildus (Kilmacud). St. Benildus Chess Club has been particularly successful in producing young talent in recent years, shown by their representation on the Irish under 12 team by four of the six team members in 2018. Gonzaga College dominate the secondary school chess scene, having swept the board at under 19, under 16 and under 14 level in Ireland for much of the last decade. They are also the reigning champions of the Millfield International Chess tournament, a competition which pits the top schools in Ireland and the UK against each other. As the winners of the last five consecutive editions of this international event, Gonzaga boast a level of superiority that even the Dublin footballers cannot yet match (unless they complete their ‘Drive for Five’ this summer, of course). Some of their past pupils have even gone on to represent Ireland on the European and world stages. At university level, however, the game is less established. While there has always been a strong chess club in Trinity College, UCD Chess Society is a relatively new entity. The club was officially formed in 2016, and has been active ever since, with just under 200 members signed up for the 2018/19 college year. They provide an attractive proposition for established chess players who wish to play with like-minded college students in a social environment. Beginners are also welcomed into the club through weekly basic lessons. The society host events such as the UCD Blitz tournament each year, which attracts players from all over the country. They also organise seminars which have been delivered by famous chess players such as Baburin and Judith Polgar. Like any conventional physical sport, chess features several competitive leagues and tournaments. There are six divisions in the Leinster leagues which have grown considerably in recent years, with 89 teams involved in the 2018/19 season compared to just 63 in 2003/04. There is promotion and relegation from each league, just like in any sporting division. The leagues serve as one of the main platforms for progressing players since they can move to play on teams in higher leagues within their clubs once they become too strong for their existing level. Most clubs have teams in at least two leagues, with larger clubs such as Rathmines, St. Benildus and Elm Mount (Drumcondra) having more than five teams apiece. UCD entered their first team into the Leinster leagues in 2016, and are now in Division 4 where they are occupying a promotion spot at the time of writing. Munster has a similar, albeit smaller, structure. The tournament scene has grown immeasurably of late, with competitions taking place across the country over weekends and holiday periods. These competitions are split into sections of differing strength, from beginner to master level, giving every player the opportunity to play against opponents of a similar standard. There is an annual calendar of tournaments all over the country from locations ranging from Dublin to Cork and Bunratty to Kilkenny. UCD are often strongly represented at these tournaments. The largest tournament of the year, the Bunratty Chess Festival, took place in the last month. A staggering 343 players competed across the four tournaments, a steady increase from an entry of 291 players in the 2013 edition. Nine Grandmasters from across Europe, including Barburin himself, played in the master’s section. There was success for UCD, with auditor Jonathon Peoples winning joint second place in the ‘Challengers’ section (the section below the master’s section) with a near perfect score of 5/6. New tournaments are being added to the calendar each year to accommodate the demands of the growing chess community. Although the exponential growth of chess in Ireland may be behind the argument for the game to be regarded as a sport gaining momentum, the game’s continued expansion and progression does not rely on this. While official recognition from sporting councils may lead to increased funding, fighting for this acknowledgement need not be the priority for the powers that be in Irish chess. Thanks to the tireless work of Baburin and many others, the game will continue to be played and enjoyed by thousands of new players each year regardless of whether the general public view it as a sport. Previous articleWhy is Orla Gartland like this?